The video conference will take place via Zoom, which can be accessed via computer or smartphone. Lance Erickson received his MA from CREEES in 2001. He is currently the Assistant Cultural Affairs Officer at the U.S. Embassy in Astana, Kazakhstan. In his U.S. Department of State role, he facilitates several academic, cultural, and professional exchange programs throughout Kazakhstan. After finishing his degree at UT, Lance worked in Kyiv, Ukraine, as Country Director for Sidvim, Inc., a medical training and sales company based in Chicago. He also served as Assistant Director for Student Services at Indiana University's Russian and East European Institute (2005–07) and Assistant Director of Ohio State University's Center for Slavic and East European Studies (2007–12). Since joining the Foreign Service, he has held posts such as Vice Consul at the U.S. Embassy in Moscow (2015–17) and Press Attaché at the U.S. Embassy in Sofia, Bulgaria (2013–15). Brian Selman completed his BA with CREEES in Russian Language and Culture in 2014 and MA in Russian, East European, and Eurasian Studies in 2017. He is currently a Vice Consul at the U.S. Embassy in Warsaw, Poland, where he uses his Russian language daily in visa interviews. Between completing his BA & MA degrees, he spent a year teaching English in Moscow. Upon completion of his MA, he worked as a Senior Study Abroad Advisor at Texas Tech University before becoming a Russian-language Foreign Service Consular Fellow with the Department of State. 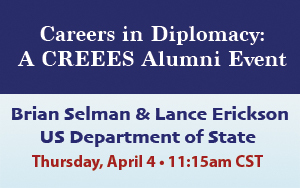 Our alumni will be sharing their stories and advice with UT students and alumni in an informal capacity with the understanding that the views shared do not reflect the views of the U.S. Government or the Department of State.